farmlandgrab.org | The coming of foreign farm investors…what lessons for Nigeria ? The coming of foreign farm investors…what lessons for Nigeria ? Nigeria is endowed with enormous natural resources: large hectares of arable lands for crop cultivation and livestock breeding; robust aquatic splendour, aquatic wealth – super natural endowments that can stand their own anywhere in the world. There have been chains of infusion of aids over the years yet we have not felt the impact of such aids. As robust and promising as arable land crop cultivation is in Nigeria , it remains under cultivated. Nigeria ranks 20th on the 2006 Global Hunger Index. About 65 per cent Nigerians are food insecure that is, insufficient access to the amount and variety of food for a healthy and productive life. Malnutrition is widespread: About 40 per cent of children fewer than five are stunted, nine per cent are wasted and 25 per cent are underweight. Micronutrient deficiencies in vitamin A, iron and iodine are also widespread. This food insecurity and malnutrition is as a result of our inability to exploit the full national agricultural potentials. Nigerian agriculture is dominated (about 90 per cent) by its over 14 million smallholder farmers. The average yields of major staple crops remain far below most of the other developing countries. Nigeria agriculture is mainly rain fed and has not taken full advantage of its irrigation potential estimated at between 2 and 2.5 million hectares. The area under irrigation is officially estimated at about 220,000 hectares, or less than one per cent of the total area under crops. The contribution of irrigated agriculture to crop production is therefore very small. The solution therefore, is to tap to the fullest our agriculture potentials. We have an advantage over the developed world on this issue. They have tapped their potentials almost fully if not fully. It is the same story with other poor countries. This no doubt is why the Middle East needs Nigeria and others in Nigeria ’s category, to feed its population. And this crisis-prone oil reach region has moved in with petrol dollar to effect this. First Bank Trust for instance, has $1.8 billion (N264.0 billion) from the United Arab Emirates loanable for agriculture. South Korea has signed up land deals with United Arab Emirates (UAE) for 400,000 hectares and Egypt has secured a similar deal to grow wheat. 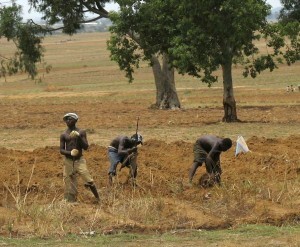 Reports have it that Sudan will set aside for Arab governments about a fifth of its cultivated land. This buying off of farms in poor countries is not limited to the Gulf States that is - Saudi Arabia, the United Arab Emirate (UAE), Bahrain , Kuwait , Oman and Qatar . China is highly into it too. It has secured the right to grow palm oil for biofuels on 2.8 million hectares of Congo , which would be the world’s largest palm oil plantation. Under negotiation is two million hectares to grow biofuels in Zambia , a country where Chinese farms are said to produce a quarter of the eggs consumed in Lusaka , Zambia ’s capital. The International Food Policy Research Institute (IFPRI), a think-tank in Washington , DC , says between 15 million and 20 million hectares of farmland in poor countries have been subjected to transactions or talks involving foreigners since 2006. IFPRI calculates that these land deals are worth $20 billion-30 billion - at least ten times as much as an emergency package for agriculture recently announced by the World Bank and 15 times more than the US administration’s new fund for food security. The Middle East imports 60 per cent and 50 per cent of its meat and fish consumption respectively; and surpasses Europe in poultry import by 76 per cent (806,000 tonnes versus 457,000 tonnes for Europe ). Its annual food import is over 20 billion U.S. dollars, including 12 billion and 4 billion U.S. dollars for Saudi Arabia and UAE respectively. United Arab Emirate attracts about 15 million visitors annually to Dubai , its trade, commerce and financial capital; rely on import of 85 per cent of its consumables annually to satisfy the demands of its population of 4.5 million, of which about 80 per cent are foreigners. These Gulf countries have identified Sub-Saharan Africa as a source of growing and/or producing their imported food. Nigeria comes in big here. Is it wise for Nigeria to allow these rich food importers to come in and do business here? Let us look at this issue closely. It is not that farming outsourcing did not happen in the past. We can recall that after the collapse of the Soviet Union in 1991, foreign investors rushed to acquire former state-owned and collective farms. We can also recall the ‘banana republics’ that were dominated by foreign-owned fruit plantations. Farming outsourcing reigned but cash crops were involved – coffee, cocoa, shea-nut, cotton, rubber, etc. Our erstwhile colonial masters made us perpetual producers of primary products – raw materials for their industries and ensured we did not set up industries. But now it is food crops for consumption and biofuels. We should be mindful of our food security. Currently, going by housewives and market surveys, food prices have doubled, more than double in some cases. And Nigerian agriculture, like elsewhere in Africa , is largely smallholder farming as cited above. What this means is that we are doing subsistence agriculture. Commercial agriculture as embedded in the Middle East project is foreign to Nigeria. The coming of rich food importers to do farming here will therefore boost food production. But if the food produced by our Arab partners is shipped out 100 per cent, some damage will be done since our food security will be threatened. It is not clear whether a strategy is in place to ensure that part of the food produced by the rich food importers farms will be sold locally. This should be the case. Good, foreign exchange will be earned, and we will not have to depend on only oil as foreign exchange earner. Additionally, jobs will be created. But some local farmers will be displaced - they will transform from the status of self-employment to that of employment. You may want to say what is wrong with this since these farmers will not be sure of regular income that may be more than what they were earning as subsistence farmers. But you may be wrong. Why? The Alliance for a Green Revolution in Africa (AGRA) and the International Center for Soil Fertility and Agricultural Development (IFDC) are concerned about the plight of Nigeria ’s smallholder farmers and are out to help out. A recent AGRA document which has to do with its partnership with some UN agencies for boosting food production in Africa, says per capita food production has declined in Africa for the past 30 years and farm productivity in Africa is just one-quarter the global average. It says today, more than 200 million people are chronically hungry in the region, and 33 million children under age five are malnourished. The document says for AGRA, to turn things around, there is need for urgent focus on raising agricultural productivity; more investment is needed to improve soil and water management of rain fed and irrigation agriculture, more adaptable new crop varieties, improved access to seeds and fertilizers, environmentally sustainable integrated pest management practices, reduction in post-harvest losses, and improvement of rural infrastructure, especially roads and communication infrastructure. The document argues these will need to be bolstered by bold pro-poor policies to help transform smallholder agriculture. When this opportunity is taken along with the Federal Government’s N200 billion new agriculture fund, we will have on our hands something substantial about agriculture. It would be recalled that President Umaru Musa Yar’Adua approved that the Central Bank of Nigeria (CBN) should mobilise N200 billion agricultural funds to be disbursed to commercial farmers at an interest rate of nine per cent through commercial banks. The apex has part-disbursed the N200 billion ($1.35 billion) raised in a bond sale to fund development of the agricultural industry. The fund will be distributed to what the apex bank tags ‘commercial farmers’ in Nigeria through UBA and First Bank and will be monitored by the Central Bank. The programme is aimed at boosting agriculture as part of a plan to diversify Nigeria ’s economy the report said. One would advise disbursement to smallholder farmers through some cooperative farmers’ arrangement and not some nebulous commercial farmers. The rich food importers project is by far different from the white Zimbabwean farmers in Kwara State project. The white Zimbabwean farmers are here to do commercial farming that will benefit Nigerians. Graham Hatty one of the white farmers says it all: “The Kwara State government approached the Zimbabwe Commercial Farmers Union in 2004. As we had lost our farms due to Zimbabwe ’s land reform process, the Nigerian government was offering us a wonderful opportunity to do what we love. They said they wanted commercial farmers because there are very few in Nigeria . So a group of us, representing different facets of agriculture, went up to Nigeria to have a look and see if there is any potential up there for us. In order to show us that they were serious, the Kwara State government paid for the whole trip. We went around the country and met the president, the vice president, bank managers and entrepreneurs. They really made sure that we knew what was behind what they wanted us to do. Will the rich food importers project do same? Not likely.